イブロウは眉頭と眉山と眉尻の3点の位置があります。皆さん個々にその位置を習得できれば、バランスの良いエレガント眉、クールな眉、 ナチュラルな眉、全てのパターンを作ることができます。For this issue, StyleUp invites Airi Kano, who is a Japanese makeup artist to share the tutorial of a having a natural eyebrow. For eyebrows, you can divide them into 3 different sections, which is the start, arch and the end. 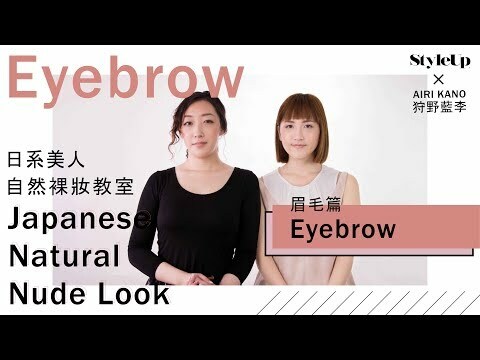 Once you memorize these parts, you can easily learn how to have suitable, sharp or natural eyebrows. There is a wide range of eyebrow shapes; western countries prefer higher arched eyebrow and Korean like straight eyebrows. However, how to find an eyebrow shapes that match your face shape is the most important. The start of your eyebrow should follow a straight line up from your nose to the top of your ears. Your eyebrow end should follow a straight line up from your nostrils to the end of your eyes. The start of your eyebrows should be the lowest part of your whole eyebrows. Arch shape: Long Face: arch should be forward, which can make your face look shorter. Round Face: arch should be backward, which can lengthen your face. While trimming your eyebrows, using a scissor is better than a tweezers, which can prevents affecting your eyebrow shape in the future. But for the stray hairs, tweezers is applicable. You can choose the brow mascara color, which matches with your hair color, and brown mascara goes well with most people. To present a natural eyebrow, apply the mascara backward. Lastly, if some part of your brow had too much mascara sticks on them, use the brush to brush over. Copyright StyleUp the articles are not allowed to be copied without permission.